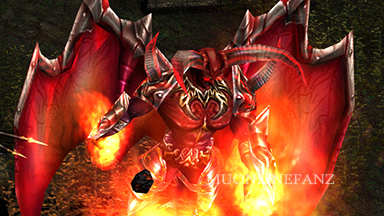 [Guide] [Master Quest] <+> [MU Online Fanz] <+> Official 3rd-party [MU Online] Fan Site & Game Guide! NPC [Apostle Devin], in [Crywolf], is searching for a mighty warrior to accept a very difficult quest. Ultimatly, he plans to infiltrate [Balgass' Barracks] and kill the evil war lord, [Dark Elf], that lurks within! The [Dark Elf] is there, training soldiers to attack the contenient. 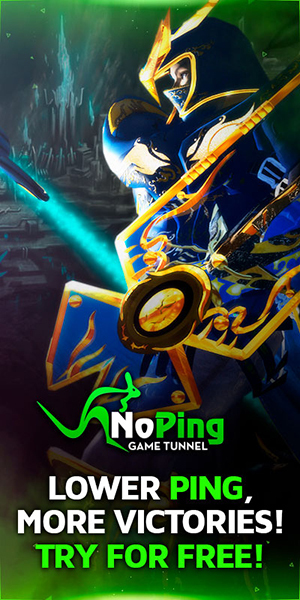 This task will not be easy, and it may be the most difficult battle you've encountered yet! It is wise to form a [Party] to take on this difficult quest. Located in [Crywolf] (228, 48). Offers a [Quest] for [Tier 2] [Character Classes], between [Character Level] [Level 380] ~ [Level 400]. [Blade Knight] requires the [The Dark Stone] [Quest]. NPC [Werewolf Guardsman] requires (x3,000,000) [Zen] as a fee, each time you enter [Balgass' Barracks]. When the [Into The Realm of Darkness] [Subquest] is completed, the entire [Quest] will be completed! Characters can join a [Party] to complete this quest at the same time. Talk to NPC [Apostle Devin] and he will request (x5,000,000) [Zen] from you. If you give him the [Zen] he will share his knowledge with you. [Death-Beam Knight Flame] is dropped from [Death Beam Knight]. 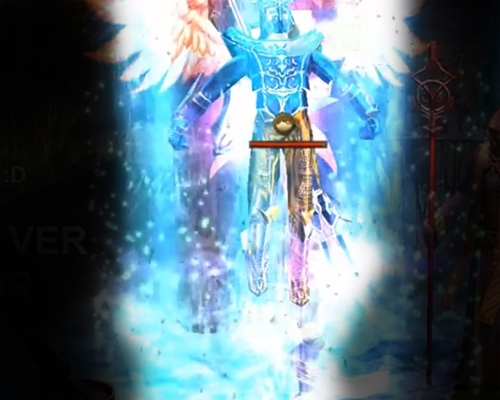 [Death Beam Knight] is located in [Tarkan], with 2 respawn locations. [Hell-Miner Horn] is dropped from [Hell Maine]. [Hell Maine] is located in [Aida], with 2 respawn locations. 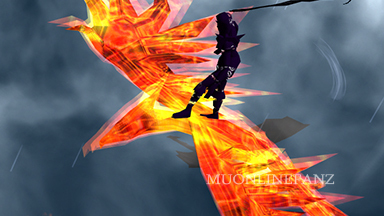 [Dark Phoenix Feather] is dropped from [Phoenix Of Darkness]. [Phoenix Of Darkness] is located in [Icarus], with 2 respawn locations. These [Quest Items] have a low [Drop Rate]. All 3 [Quest Items] must be in your inventory to complete the quest. Once you've collected all the [Quest Items], return to NPC [Apostle Devin]. Open the [Quest Menu] to check the current status of the quest. The character or [Party] which deals the most damage earns the credit for a monster kill, and its item drop. [Quest Items] only drop when the relavtive quest is active. [Quest Items] can still drop when the character is in a [Party]. [Quest Items] can be picked up by a character if the relavtive quest is active. "Lugard has requested a favor of you." 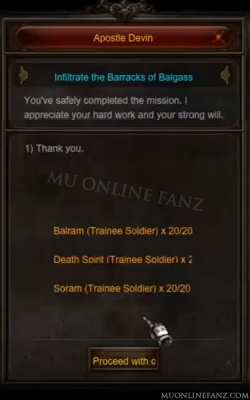 "He wants you to seek heroes to oppose Balgass' new threat to MU." "Balgass' army is approaching through the Crywolf Fortress, but we don't know the full extent of their plans yet." "I'm not sure what Lugard is thinking, entrusting us with something this important. I really don't think we are strong enough." "I believe you've been sent to us for a purpose. Are you interested in working with us?" -- "I will work with you." "Before you begin, I need to check that you're powerful enough for the mission." NPC [Apostle Devin] hands you a note with 3 items listed on it. "Congratulations, you've completed the mission. 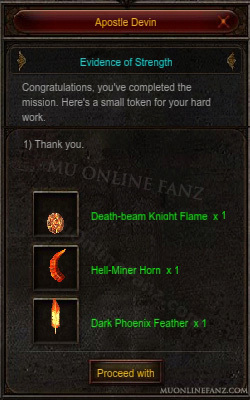 Here's a small token for your hard work." -- You keep listening, as he gifts a reward. "Balgass is a great threat, as he is, since he's in cooperation with Eresia, the Queen of Sorcery, and has brought such danger into this world." "We predict that Balgass is attempting a new threat against the Continent of MU with his army of evil sorcery." When you've collected the requested [Quset Items], return to NPC [Apostle Devin] and he will reward you. Talk to NPC [Apostle Devin] and he will tell you about Balgass and its Barracks. He would like to learn additional information about [Balgass' Barracks], by infiltrating it. [Balgass' Barracks] is entered by speaking to NPC [Werewolf Guardsman]. NPC [Werewolf Guardsman] is located in [Crywolf] (63, 239). 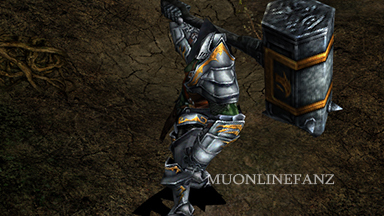 Inside [Balgass' Barracks], find and kill the requested monsters. [Balram] is located near the entrance of the map, while [Death Spirit] and [Soram] are located deeper inside the map. Once you have killed the monsters, return to NPC [Apostle Devin]. The [Party] feature is allowed inside the [Balgass' Barracks] map. The character or [Party] which deals the most damage earns the credit for a monster kill. "Welcome, you are truly ready to help us now." -- "What do you need help with?" "Well, according to our information, Balgass has formed a location called the Barracks. The 12 apostles of Lugard believe this is a new threat from Balgass." "Lacking the exact information about the Barracks drives one to want to enter the Barrack zone to destroy any further development of Balgass' army." "Fortunately, Lugard's guardianship could help find the way to enter Balgass Barrack. Enter the zone, destroy the soldiers, and gain accurate information. Will you bring back the proper data accordingly?" -- You accept the request, and he hands you a note. "Go to the northern graveyard of Crywolf and find the soldier that escaped from the Balgass' Barrack. Lugard's blessing has allowed him to have the intelligence to get you inside of the Barracks. He calls himself Werewolf Guardsman." "You've safely completed the mission. I appreciate your hard work and the strong will." -- You thank him, as he gifts a reward. "You have been great help in bringing peace to the continent of MU and Crywolf by getting all the information on the Barracks and destroying all those monsters." After you have killed the monsters requested, return to NPC [Apostle Devin] for a reward. Talk to NPC [Apostle Devin], again, and he will request (x10,000,000) [Zen] from you. He needs the [Dark Elf] killed, which lurks in [Balgass' Resting Place]. [Balgass' Resting Place] is located at the end of the path in the [Balgass Barracks]. 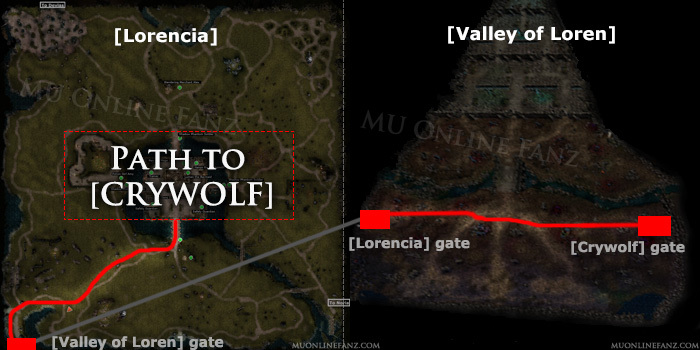 Go back to [Balgass' Barracks], via NPC [Werewolf Guardsman] in [Crywolf] (63, 239). Go to the "end" of the [Balgass' Barracks] map and find the [Gatekeeper]. 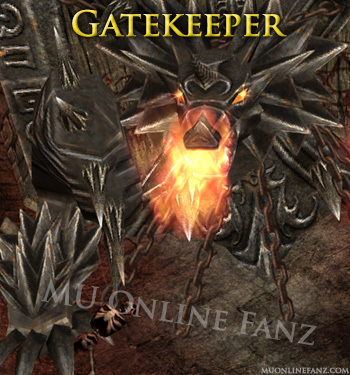 Use the [Gatekeeper] to enter [Balgass' Resting Place]. Inside [Balgass' Resting Place], there will be many monsters lurking. 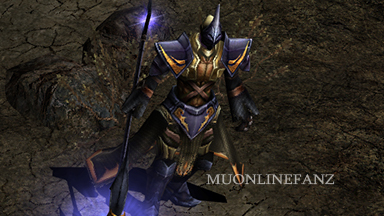 Amongst the monsters, find the [Dark Elf (Trainee Soldier)] and kill it! The [Dark Elf] has a 4 hour respawn time, so you may need to check other servers. 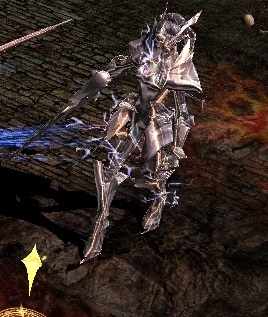 The [Dark Elf] can [Stun] your character for 3 seconds. 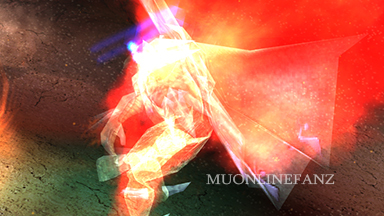 This [Stun] effect is powerful, because the other monsters can deal a lot of accumulative damage while you are stunned. 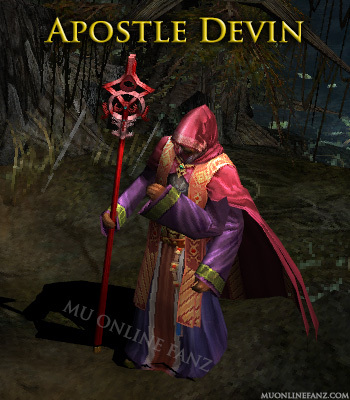 Once the [Dark Elf] has been killed, return to NPC [Apostle Devin]. The [Party] feature is allowed inside the [Balgass' Resting Place] map. "Your initiative courage has given hope to us all." "Balgass has gone into hiding while he recovers and rebuilds his army." "In order to carry out Lugard's mission, Balgass' exact location must be found and the army in training destroyed." "The final mission to is going to be a difficult test. Are you still interested?" "Enter at the northern edge of the Barracks. Secure the area beforehand so our forces can advance." 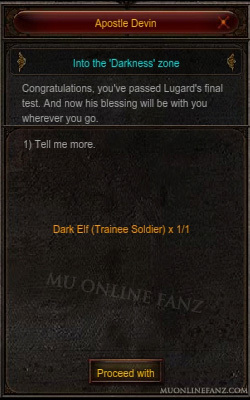 "Congratulations, you've passed Lugard's final test. And now his blessing will be with you whereever you go." -- You keep listening, as he gifts a reward, and blesses you with additional knowledge. "Your hard work to keep peace in the continent of MU and Crywolf from Balgass' has paid off. I cannot thank you enough." Located in [Balgass' Barracks] (120, 168). Entrance to [Balgass' Resting Place].